Hello, and welcome to my first official post on my new blog! I hope you become a frequent visitor. Feel free to comment and ask questions! I would love your feedback! Birthday cards are a staple to have on hand. You never know when you will need one. I put together this card for someone special. I've had the Simon Says Stamp Spring Flowers stamps in my possession for quite some time and finally stamped them out! 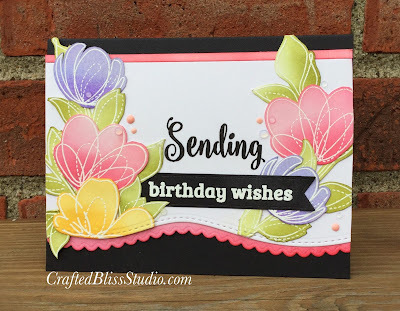 I heat embossed them and filled them with color using Distress Inks. The curved edge and scallops were achieved using dies from Pink & Main called Scallop Wave Dies. Did you ever have a project that was just about finished and you were putting the finishing touches on and then something happens and your heart drops! Yes, that is exactly what happened here! As I was adding my sentiment to the front of this card. The stamp fell off my Misti and left a black mark right in the center of the card! Ugh! My heart dropped! I fidgeted with this card, tried to take my flowers off so that I could salvage them but my glue held on too tight. I thought I was going to have to scrap this and move on to another project. With frustration I set it aside for a day. When I came back to it, a solution came to me. I had this birthday wishes banner set aside from another project that I hadn't used. I put it over the inked spot on the card and it covered it perfectly! Yay! Card saved! The sentiment is from Craftin Desert Divas Wishful Thoughts Stamps and the banner is from the Flag Banner Dies. To really complete the card I added a few Nuvo Drops. This is the first card I had made in quite some time so I still feel a little rusty but I would count this as a success!